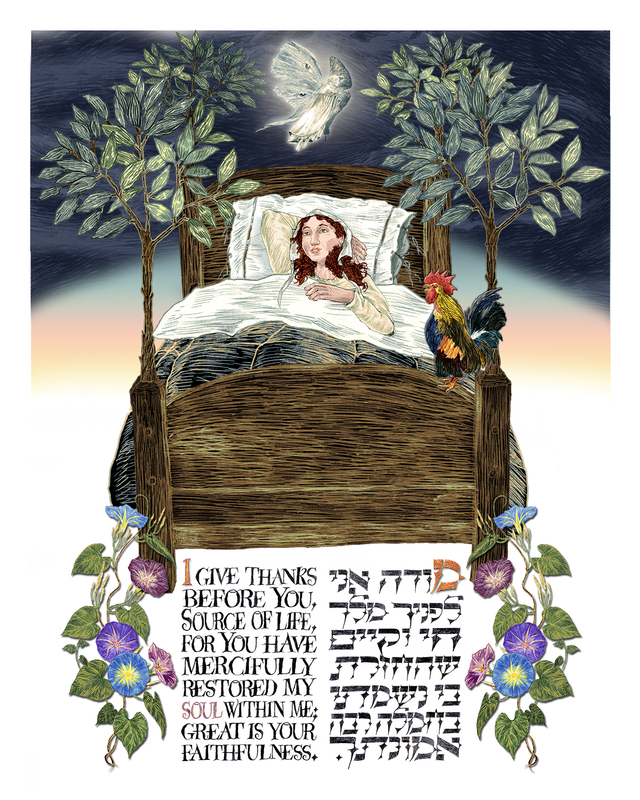 This week, the rare confluence of the Thanksgiving and Hanukkah holidays, each a unique tale of struggle, survival and miracles, has inspired me to present the Modeh Ani next for An Illumination Of Blessings. Here’s why: I’ve been thinking about the nature of miracles, how our perception of them has changed over time and the subtle reference to them in this blessing. When we think of miracles, the big, cinema-worthy Biblical ones such as Noah’s postdiluvian rainbow, the parting of the Red (Reed) Sea in Exodus or the appearance of manna in the desert usually come to mind. Biblical history tells us that such phenomena mysteriously appeared to precipitate a great crisis or in the wake of one and were meant to induce our fear, obedience, humility and faith in G-d. But in the absence of such grand miracles since post-Biblical times and the influence of our scientific understanding of nature’s laws, it’s easy to imagine those reactions fading into memory. And as we live our mundane day-to-day lives, it’s easy to blink past the one ubiquitous miracle we cannot afford to take for granted; waking up each morning. We’ve often heard of friends, family or celebrities going to bed one night and waking up dead. News of such a passing is especially unsettling when, like me, you are a contemporary of some one lately deceased in this manner, leaving no opportunity for closure either with loved ones or with unfinished tasks. Of course, we can’t know the extent of our own timelines, nor would most of us wish to. Nevertheless, beginning each morning with a certain mindfulness can enable us to meet each day’s challenges with the physical and emotional strength needed to recognize and accomplish our goals. Certainly, there’s nothing new about this idea; such philosophies generously pepper myriad self-help books and motivational speaker’s scripts. Yet, a simple blessing like the Modeh Ani has both the spiritual and scientific chops to make it worthwhile learning and remembering. The Modeh Ani was first composed as a Kabbalistic (mystical) invocation among the Sephardic Jewish community in the Seder Avodas Hayom attributed to the 16th century Rav Moshe ben Makhir of Tzfat (Safed), a contemporary of Rav Yosef Karo, the compiler of the code of Jewish law, The Shulchan Aruch (The Set Table). Soon after, the blessing appeared in a 1687 Ashkenazic prayerbook (siddur) called the Derech Yeshara. Uniquely, it makes no mention of G-d’s Name allowing its recitation immediately on awakening before relieving ourselves and washing our hands. According to halakhah (Jewish law), it is not permitted to pray with G-d’s Name before washing, so the prayer was composed as a compromise alluding to G-d’s Name but not actually saying it. Recited each morning, the Modeh provides an opportunity to express our gratitude for the return of our soul to our bodies. Rationally, it can be said that we haven’t gone anywhere; that sleep is merely a restorative, physiological process, but that only begs the question: why were we given the ability to sleep in the first place? I’ll close here with an apocryphal tale that you can take for what it’s worth. It addresses both the spiritual and physiological rationales of sleep. At an alleged 2008 international conference of neurologists, the main topic was the phenomenon of fainting when arising from sleep. A British professor presented a paper on her investigation of this issue, concluding that fainting is due to the rapid motion occurring between laying down and standing up. She pointed out that it takes twelve seconds for blood to reach the brain from our feet and when we stand up too quickly, that process is compromised causing one to faint. The professor suggested that one should sit up slowly, counting to twelve to avoid dizziness or fainting. This entry was posted on November 25, 2013 at 11:56 AM and is filed under Imaginarius Updates. You can follow any responses to this entry through the RSS 2.0 feed. You can leave a response, or trackback from your own site. Thank you, Shelley, for your encouragement!